Any quantity only $11.99 per oz over spot! Frank Frazetta is one of America’s greatest artists in the genres of fantasy and science fiction. His depiction of Conan for the paperback version of “Conan the Barbarian” is credited with launching a career that would result countless masterful works of art. Right now, his designs live on with the release of the 1 oz Silver Proof Frank Frazetta Legacy Collection Death Dealer Round. More and more often investors are turning to rounds as a way to invest in silver as they are a great alternative to silver bars due to their low premiums over the spot price of silver, and unique designs such as this one. Mintage for these rounds capped at 10,000 in total! Each round ships with a Certificate of Authenticity. Edge lettering identifies individual serial number. 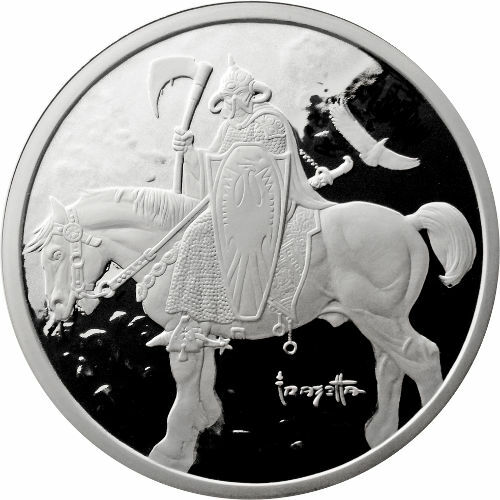 Obverse features the Death Dealer design. Reverse bears the portrait of Frank Frazetta. Designed by Luigi Badia and authorized by Frazetta’s son, Frank Jr.
Frazetta was the only son in a family of four children, and was born and raised in Brooklyn, New New York. By the age of 16, Frazetta’s artistic creations caught the eye of at least one critic: his grandmother. Before his death in 2010, Frazetta recalled his encouraging him in his artistic endeavors from the age of 2. The Death Dealer design featured on these 1 oz Silver Proof Frank Frazetta Legacy Collection Death Dealer Rounds was created in 1973. It originally appeared on the album cover of Molly Hatchet’s first record release, and has since appeared on various posters, art works, and even the logo of the US Army’s III Corps. On the obverse of these rounds you’ll find Luigi Badia’s recreation of Frazetta’s original Death Dealer. The fearsome iron-clad warrior is depicted on horseback, wearing a horned helmet that obscures his face, holding a long shield in his left hand, and wielding a blood-covered axe in his right hand. 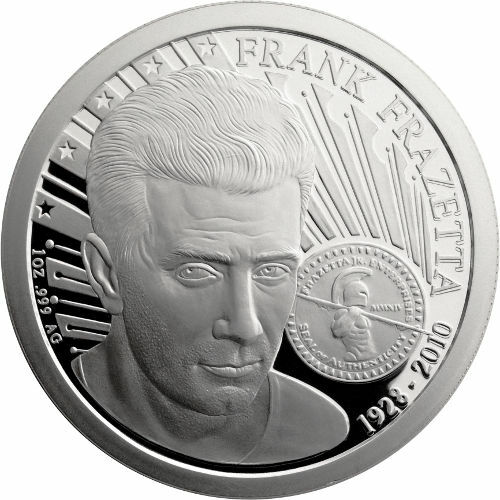 The reverse of each 1 oz Silver Proof Frank Frazetta Legacy Collection Death Dealer Round features a portrait of a younger Frank Frazetta, as well as engravings of his name, birth year, and death year. Each round in the Legacy Collection has a recreation of popular Frazetta designs from Italian sculptor Luigi Badia, and is authorized by Frank Jr. Enterprises. The Osborne Mint in Cincinnati, Ohio strikes these Frank Frazetta Legacy Collection rounds. Found in 1836, Osborne Mint is America’s oldest private mint.